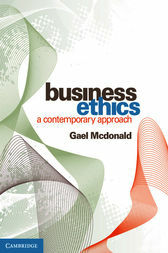 Business Ethics introduces students to ethical issues and decision-making in a variety of contemporary contexts. It develops an awareness of the many ways in which ethical considerations can manifest in commercial domains, thereby helping prepare students for their professional careers. Business Ethics shows how theory works in practice. It includes hundreds of real-world examples that will help engage students. Examples draw on recent and emerging concerns, such as the moral implications of social media and the enforcement of codes of behaviour within industries. The book also addresses corporate social responsibility, stakeholder management and sustainability, reflecting the broad scope of business ethics today. Comprehensive online resources are available at www.cambridge.edu.au/academic/businessethics. Student resources include additional review questions and case studies, with answer guides, to help students reinforce learning and prepare for assessment tasks. Instructor resources include an extensive set of tutorial exercises, PowerPoint slides and a test bank of assessment resources.